The Fund EcoMarket database tool segments ‘Sustainable and Responsible Investment’ options according to their ‘core SRI attributes’ or ‘Styles’. These are the features that primarily differentiate such investments from other fund options, they are also often the key reason SRI and ethical funds are of interest to clients. For the purpose of this tool ‘core SRI attributes’ means ‘the way a fund deals with ethical, social, environmental and/or governance related issues’. ‘Balanced’ Ethical funds combine a wide range of positive and negative ethical screening policies as part of their investment strategies and may apply ‘best in sector’ strategies. ‘Negative’ Ethical funds use clear, often strict, negative ‘ethical’ screens to avoid a number of areas on ethical grounds (eg armaments, tobacco). Sustainability Themed funds focus on sustainability related issues and opportunities as part of their investment strategy. Environmental themed funds significantly integrate environmental issues into their investment strategies, sometimes alongside ethical avoidance criteria – sometimes with a focus on ‘solutions’ companies. 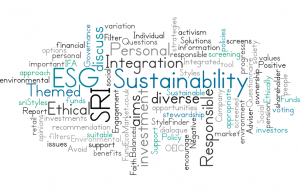 ESG Plus – a ‘fund’ or ‘corporate level’ strategy that involves fund managers considering Environmental, Social and Governance issues to improve their investment analysis and risk management. Listed options go ‘beyond’ industry norms. Responsible Ownership – a ‘corporate level’ strategy whereby some fund managers use their position as investors to encourage the companies they invest in to raise their standards across key environmental, social, governance or other issues. How are ‘SRI Styles’ useful to financial advisers? Segmenting the SRI market into ‘Styles’ can help simplify the SRI advice process for many ethically minded clients. Advisers can identify which SRI Styles best suit their clients needs (via the Fund EcoMarket tool ‘SRI Aims’ question, or via the SRI StyleFinder client microsite) . Findings can then be matched to our segmented SRI fund database (Fund EcoMarket). This enables advisers to fact find their client’s SRI Aims and identify all potentially relevant SRI options quickly and easily. This system is based on publicly available information – although we contact fund managers to collect additional information as required. For introductory, fact finding and style specific information please use the links on left of your screen. The Fund EcoMarket database lists all the Life, Pension, OEIC/UT and IT sustainable, responsible and funds funds that we are aware of. Other options are added at our discreteion. The information in in the text and SRI specific filter fields (eg Policy and Features) is primary research – carried out by sriServices, supplied by fund managers. sriServices makes no judgement regarding the quality or appropriateness of investments or SRI strategies as different strategies suit different clients. This information is not intended to be viewed as advice or any form of recommendation. sriServices is not regulated or authorised to offer advice. Nothing we publish is intended to be interpreted as advice of any kind. Advisers and other client facing intermediaries are responsible for their own compliance and recommendations. SRI Styles are decided by SRI Services. Intellectual Property rights reserved. This system has been developed by – and is owned by – Julia Dreblow of sriServices.